The Reds finally won their second game after eight straight losses. It may have come against the Marlins, but it still counts. 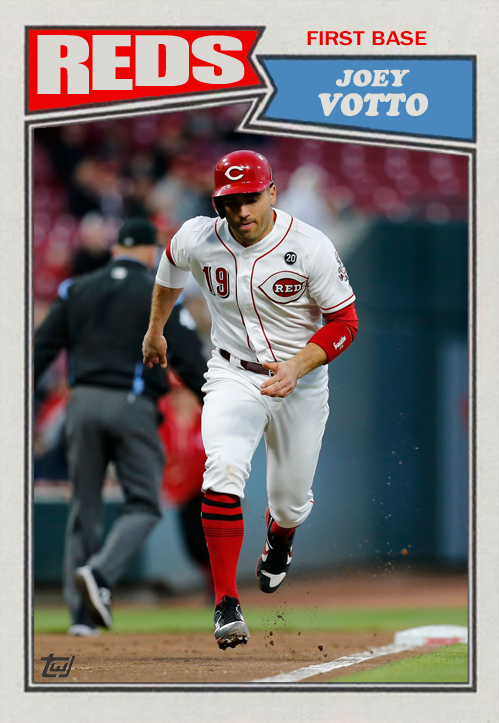 Joey Votto hit a double and scored twice, while five of his teammates went yard. Luis Castillo has had three fantastic starts so far, and I would like to remind everyone that I predicted a Cy Young season for Mr. Castillo. I’m looking forward to seeing continued dominance from this young man. 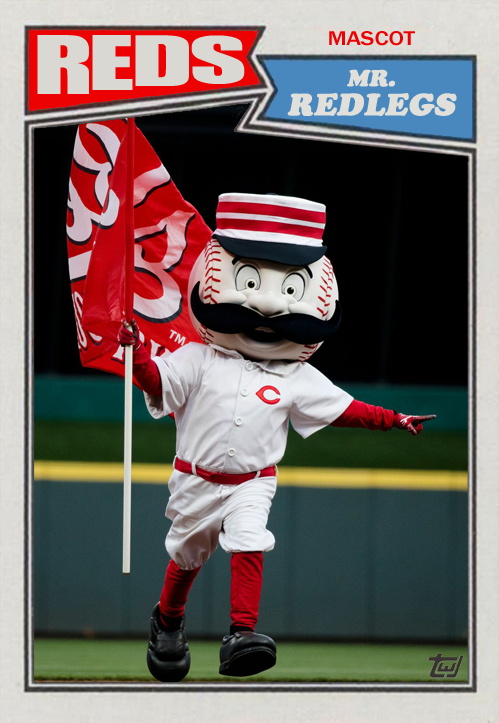 While I prefer the mustacheless “running man” logo used from 1968 into the 1990s, I have grown to love Mr. Redlegs in recent years. 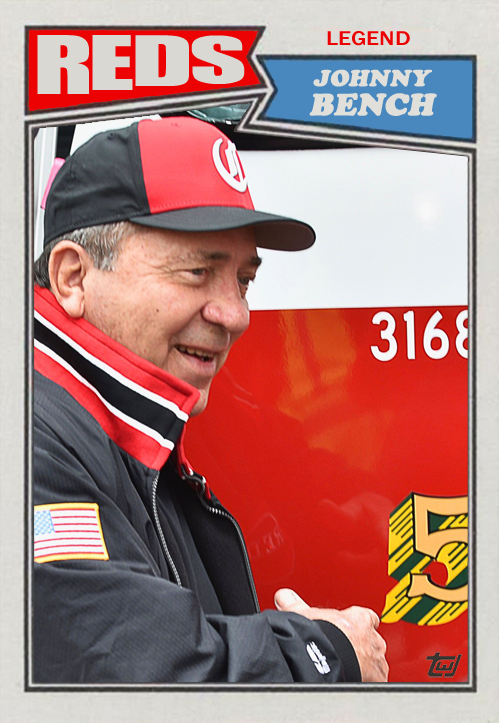 One of the greatest players ever, Johnny Bench is rightly and forever will be known as a legend in Cincinnati. Managers get cards in my sets. 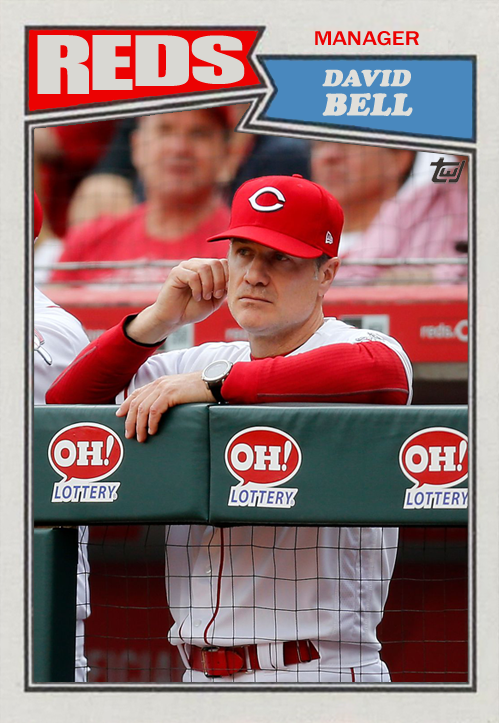 David Bell is the descendant of Cincinnati royalty; both grandfather Gus Bell and father Buddy Bell were popular players for the Reds. His little brother Mike Bell also played for the Reds, but that didn’t go quite as well. I’m hoping for the best for David. I was excited when they named him manager, and I expect him to continue the Bell tradition of excellence in the Queen City. 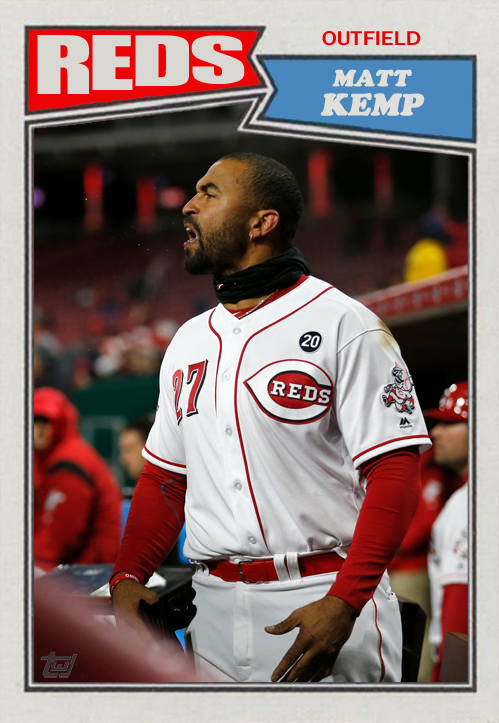 Another new face to the Reds this year is the 2011 National League Most Valuable Player Matt Kemp. 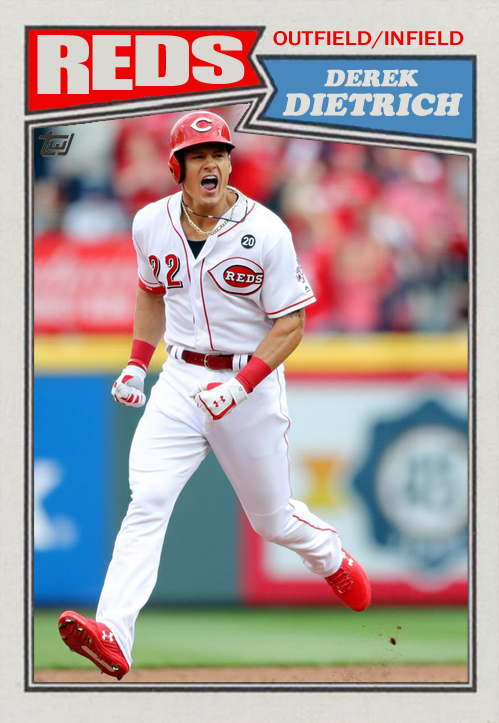 He is hitless so far in Cincinnati, but any day now that 2011 MVP mojo will come back and he will lead these Redlegs to the top of the division…the league…the world! The Reds often make the most of their bench players: Doug Flynn, Miguel Cairo, and now you can add Derek Dietrich to the list. 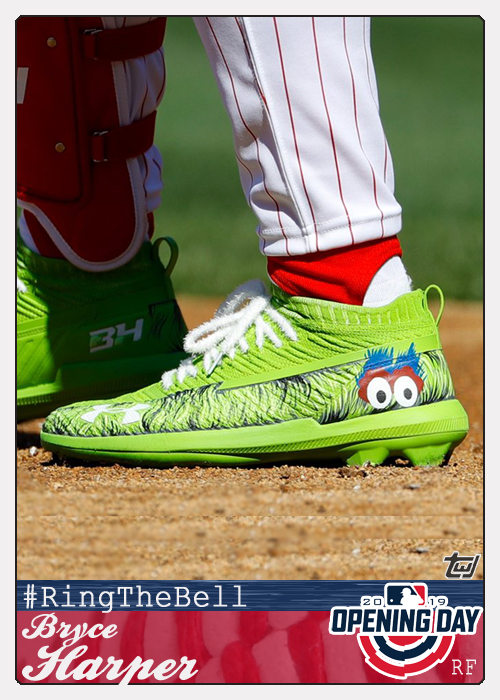 They can give the big guys a rest with a solid bat, or come in to pinch hit and deliver big. Dietrich launched a three-run homer off Richard Rodriguez in the 7th inning to put the home team ahead and they never looked back. Does that qualify as a GW-RBI? 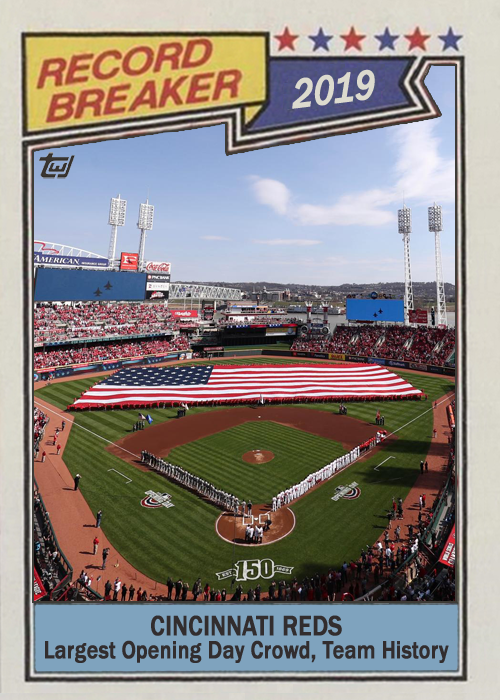 The Reds hosted their largest Opening Day crowd on Thursday, but that was followed just a few days later with the lowest attendance in the history of Great American Ballpark. 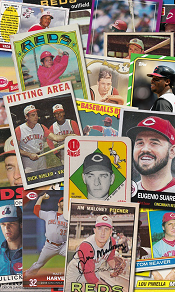 Opening Day is practically a holiday in Cincinnati, but it’s a short-lived fervor for America’s pastime. 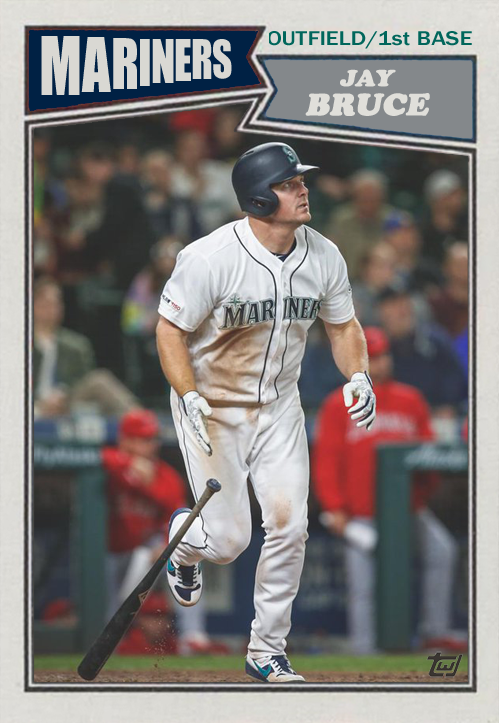 When I saw this photo pop up a few weeks ago, I knew I had to make a baseball card out of it. 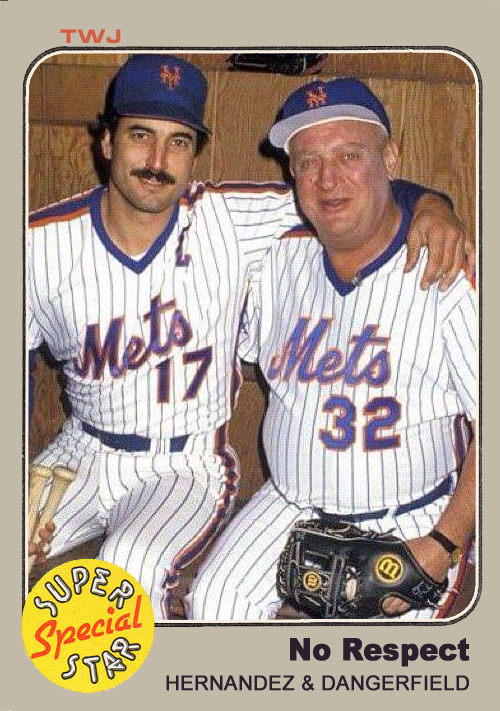 For some reason, I got a very 1983 Fleer vibe from it, even though Keith Hernandez didn’t wear the Captain’s “C” until 1987. “No Respect” is, of course, the late Rodney Dangerfield‘s catchphrase. But it can easily be applied to Mex, one of the greatest defensive first basemen in baseball history. Despite his fielding excellence, coupled with a solid offensive career, Hernandez was shunned by the BBWAA when it came to Hall of Fame consideration. He received more than 5% of the vote from 1996-2003 to stay on the ballot, but dropped to 4.3% in 2004. Is he a slam-dunk Hall of Famer? Obviously not, but he certainly wouldn’t be a bad choice either. Hopefully the Veterans Committee will do the right thing and induct Hernandez when he is again eligible for consideration. The only question then is whether he would wear a Cardinals cap or Mets cap on his Hall of Fame plaque.